From the odd, to the strange, to the unconventional, you’ll find everything from innovative art, unique natural wonders, out-of-this-world adventures and hallowed settings in New Mexico. A little wandering opens up this remarkable land. 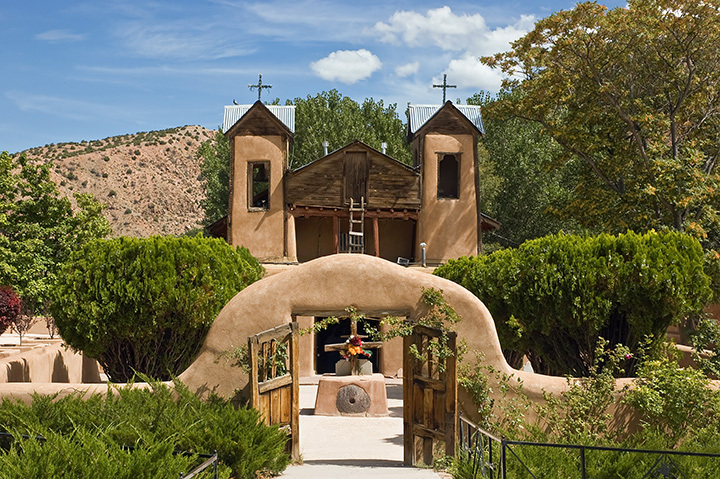 Here are the 15 most unusual attractions in the Land of Enchantment. It’s odd to feel dwarfed by a giant pistachio. In fact, it’s odd just saying that, but that’s exactly what happens when you stand at the base of this enormous 30-foot-tall nut. Billed as the world’s largest pistachio, this green and white pod-shaped one-of-a-kind concrete edifice is a son’s tribute to the original nut-lover Tom McGinn. Get your selfie shot in and then take a spin through the country store where pistachios are a food group. Open 9 a.m. to 5 p.m. daily. When you step into the small adobe chapel, the site of “el pocito” or the small pit of holy dirt that is said to have powers to heal the sick, the walls are filled with all manner of crutches and braces and personal shrines from those seeking a miracle. Founded in 1816 and now a National Historic Landmark, a pilgrimage to this holy site, to some the Lourdes of America, is transformative. More than 300,000 people come every year. A peaceful spot where doubt is upstaged by faith. The gift shop is full of unique curios. The state bird stands tall along Interstate 10 just west of town as a 20-foot tall, 40-foot long testimony to one man’s artistic vision about junk. Made of a hodgepodge of finds from the local dump, thrift store treasures and salvaged scrap metal, its Volkswagen headlight eyes, tennis shoe feathers and old keyboard-laced wings keep it grounded for all to see. Located at the rest area on the south side of I-10. Accessible only from eastbound lanes. Three mysteries await at this beautiful structure that is home to a miraculous spiral staircase: No one knows the identity of the builder. Architects and engineers are mystified by how it can balance without a central support, and the wood used to build it is not indigenous to the area—where did it come from? Add to those three that no nails or glue were used in the building of it and you have a scratch-your-head moment in the state capital. Like clouds, spotting shapes in rock formations is a fun pastime. This landmark between Santa Fe and Espanola is a renowned attraction in northern New Mexico. This distinctive formation, which without much imagination does indeed look like a camel sitting down, is just off the highway. You can see it whizzing by in your car or stop and look at it from all sides. The caves are the artist’s canvas where he’s carved intricate motifs and shrines directly into the cavern walls. Using simple tools, like pick axes and shovels, Pau-lette has spent decades creating these masterpieces, some as high as 40 feet. The 14 known chambers are not easily found, but you can take a guided tour at the Origin Resort near Santa Fe. Real or a fake? Regardless, this 80-ton stone with a written message chiseled on its surface is a believe-it-or-not experience. Known as the Mystery Stone, Com-mandment Rock, Los Lunas Stone and straightforwardly, Inscription Rock, it’s located at the base of Hidden Mountain in the Rio Abajo desert. Controversy sur-rounds its authenticity, but that only serves to add to its mystery. Is it proof of Pre-Columbian presence here or just a ruse? See for yourself. It’s just off Highway 25. You’ll need a Recreational Access Permit from New Mexico’s Land Office. Remember making a paper fortune teller? That’s a simple form of origami, the translation of which means folding paper in Japanese. Artists Kevin and Jennifer Box have taken folding paper to a whole new level of inspiring sculpture. Each piece in the collection, which includes cranes, boats, paper airplanes, animals and more, is made out of metal for permanence. A showcase sculpture is Master Peace—1,000 stainless steel cranes moving upward to a height of 25 feet. The artist’s sculptures are on display at a variety of locations including the Turquoise Trail Sculpture Garden where they were created. One of the rarest freshwater species of crustaceans on earth survives in the thermal waters of Sedillo Spring, west of town. What looks very much like a rollie pollie or pill bug you’d see in a garden, is found in very small numbers only here. Due to a water mishap in the 1980s when most of the population was lost, the species is now considered endangered. The one-time spa for people is no more, but the isopods can be seen languishing in the warm water environment. You can only get to the spring on bike or foot and the trail takes you on to private property so be considerate of the owner’s land and this, the isopod’s last home. The indigenous cultures of Africa, Asia, Europe, Latin America, the Caribbean, North America and Oceania are on display here, representing the largest collection of international folk art anywhere in the world. The museum is chock-full of more than 130,000 objects, the handiwork of artists from hundreds of countries. From Northern New Mexican weavings to Turkish ceramics to Polish figurative wood carvings, the accumulation and enormity of this much art is breathtaking. Open daily 10 a.m. to 5 p.m. most of the year. Owner Johnnie Meier wants to pump you up when you stop by his home to see his enormous collection of vintage gas pumps, old cars and gas station collectibles and memorabilia. This former Los Alamos National Labs scientist opened his museum in 1997 and has been collecting ever since. A stop here is a step back in time when gas stations were more than just a pit stop for travelers. On NM 68 between Santa Fe and Taos. If the gate is open, Meier is home so drive on in and sit a spell. “The Truth is Here,” so says the museum. In 1947, an unidentified flying object, or UFO, crashed near Roswell, scattering wreckage of what was presumed to be an alien spacecraft. The Roswell Incident, as it was dubbed, is on display here at this small but compact museum. You’ll find a container of dirt collected from the crash site, books of eye-witness accounts and even an alien dummy prop from a movie made about the incident. Information on other strange phenomena like crop circles, alien abductions and Area 51 is also represented. Here’s the only spot in the United States where you can put both feet and both hands in different states—at the intersection of New Mexico, Arizona, Utah and Colorado. This four-point area is marked with a brass plaque, reminiscent of a survey mark. A drive to this remote location, north of Farmington, takes you across wide-open Navajo land, but once at the monument you’ll find an informative visitor’s center, plus a diverse selection of vendors and artisans. A true oasis in the middle of the desert. The inviting sapphire blue water is a con-stant 62 degrees so dip your toe before you dive in to this cold water. At 80-feet wide and 130-feet deep, this swimming hole of monumental proportions is really a bell-shaped artisan spring that pumps out 3,000 gallons of water a minute. It’s part of a series of lakes connected through a sequence of underground waterways. Now a popular training spot for scuba divers, there’s still plenty of room to paddle around if you’re in the mood for a cool, refreshing dip. Somewhere on a plateau in the New Mexican desert stand 400 polished stainless steel poles, two inches in diameter and on average 20 feet high with solid pointed tips directed skyward. Each is spaced 220 feet apart in a one mile by one kilometer grid. The work of American sculptor Walter De Maria is what’s known as experiential art. To be among the poles and absorb the power of this art is the point. If you want to stay overnight, there’s a small cabin that accommodates six people. The location is a well-kept secret. Guests are picked up in town for the long ride out to this remote spot. Open May through October by reservation only. Lighting strikes are infrequent, despite the name.